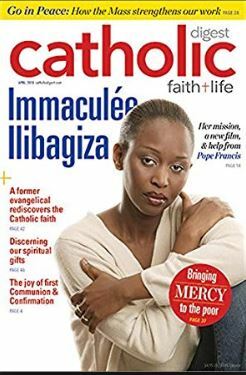 When Immaculée Ilibagiza first published her memoir Left to Tell, it was with the modest hope of sharing the book with friends. Her agent, however, told her to quit her job. The book tells in harrowing detail about the 1994 genocide in Rwanda, Africa, in which ordinary people took to the streets to wipe out 800,000 of their own friends and neighbors. Immaculée was among the hunted and her own parents and two of her brothers were killed. Yet her story is foremost a tale of hope. She shares her miraculous escape and, perhaps even more miraculous, her healing through divine forgiveness. The book quickly hit the New York Times bestseller list and Immaculée began a speaking tour that has never stopped. Her story will soon reach an even greater audience – as a major motion picture [in development as of Feb. 2019]. For Catholic Digest, I spoke with the mom of two, now living in New York City, about the movie, her mission, and a surprising promise from Pope Francis himself. Q: Before Left to Tell came out, a lot of people didn’t know that the Rwandan Genocide even happened. How about now? A: You wouldn’t believe it but some people still don’t know. Every single week I go to speak somewhere – to a church, a conference for men or women, a school – and I am amazed. What I heard was that during the three months the genocide happened, the O.J. Simpson case began. No one was watching anything else. Q: How did your life change when the book became a New York Times best seller? A: The first time someone told me my book was a New York Times bestseller, I was like, “Oh, okay.” I didn’t know what a best seller was. All I wanted was to see my book in Barnes and Noble and be able to give it to my friends. My friends kept saying, “I wish your story was in a book. I could give it to my mom, who is depressed, or to my friend, who is angry.” Those were the people I was responding to when I wrote the book. To this day, I get requests every day to speak somewhere. I talk to an average of 2000 people a week. It is something I praise God for. I can talk about my faith in Jesus. I love what I do. Q: A strong message of your book is: Stop the hate. You forgave. Do you ever have relapses? A: To tell you the truth, I don’t have any. I wanted revenge at first. It was never that I forgave because it just happened to me. I was praying for it. I was so determined to learn to forgive. I knew if I wanted to go to heaven I have to do God’s will. God’s will is, “Pray this way: Forgive us as we forgive.” Jesus said forgive – how many times? Seventy times seven. I was asking God, How can I forgive, in my situation? How can you be asking me? Believe me, I still cry to this day for my family. You can’t heal from that. But when the time came to let it go it was like, I get it. I can cry for the damage the killers did but I can protect myself from them. I don’t have to give them my whole life. I can feel at peace. Q: What happened when you met the man who killed your mother and brother? A: When I saw him in prison, I cried. I was so broken hearted to remember him as a man who had a beautiful family. I thought, Why did you do this? How can you hurt yourself this much? How can you hurt your family? What you did to me, you did to yourself! I told him I forgave him. I just wanted to free him. I just wished for him to say, What have I done? How could I do this? I told him and he covered his face. He couldn’t watch me. Q: Did it help him? Q: How has your example of forgiveness in Left to Tell, helped other people? A: I have seen people angry and I have seen people in my talks who come to me at the end and say, “I called my daughter; I have not spoken to her in three years.” Praise God. That’s what I wish for and pray for. A lady called her mom after twenty years and the anger was gone just like that. Anger is here and people are suffering because of anger and don’t know what to do or how to get rid of it. But as that grace happened to my heart, I have seen it happen to millions of people. Q: Do you ever go back to Rwanda? A: Yes, I take groups of people every August and November. I take them to the Genocide Memorial and to the Shrine of Our Lady of Kibeho. Q: [For our readers, Kibeho is where Our Lady appeared in 1981, to three young visionaries, Alphonsine Mumureke, Nathalie Mukamazimpaka, and Marie Claire Mukangango. Mary asked for prayer and conversion, and she warned of the coming genocide in 1994. It is an approved apparition.] What was Our Lady’s message? A: Our Lady asked for repentance, for people to follow the commandments, and she taught us the Seven Sorrows Rosary. It existed before but Our Lady said we forgot about it. We need it now more than ever. She said she wanted Mary Clare [one of the young seers] to teach it to the whole world. Mary Clare said, “Mother, I don’t even have money for a taxi to go to the next city. How can I teach it to the whole world? And Our Lady said [paraphrasing], “Just have the will to help me. Teach the children around you. Teach your school mates. Teach the neighbors. I will take it.” She said she will bless people through that prayer. I have seen so many miracles through this prayer. Our Lady also asked for two churches to be built. She gave the names. The smaller one should be called the Seven Sorrows of Our Lady. The larger, a basilica should be called, The Place of the Reunion of the Dispursed. To this day, thirty-five years later, they have not built it. Q: Oh my goodness, did he call them? A: He did! He told our bishop that all that matters is to make sure that the will of Our Lady is done. After the Pope called, now we are moving. Q: Let’s talk about the movie. Are you consulting on it? A: I am and I love it. It’s perfectly the truth. Q: Is it hard for you at all? A: You know I haven’t seen anything hard yet. I’m scared of that. Q: Is the movie going to have any backstory? A: Yes, they played a lot of my young age at home, the prayers, going on a pilgrimage to Kibeho. Q: What are your hopes for Left to Tell, the movie? A: My hope is that first, I hope that it will give a look at people who had a normal, simple life, who had values at the core of their family. My parents taught us not to insult each other, not to say bad words. I am so glad I had my family. We loved each other. We prayed together every single night. My parents were missionaries in the home. Every day at the dinner table talk was about helping a neighbor who was sick, who didn’t have money to go to the doctor, or go to school. I hope people will see that we didn’t have much but we had so much care for each other. Second, whatever situation you might be in, there is hope if you hold on to God. When I was going through the genocide, the only way I kept going was because I had God. It wasn’t that my character was resilient. It was that I was praying. Otherwise, I would have been dead. I hope people can say, “I can hold on. I don’t care what happens to me, I can still go on if I have God.” I was talking to the guys who are making the movie and I said I know you want to make a good business, and a good movie in the end will reach millions and give you back what you wanted to have but I hope you realize that this movie will stay behind long after we are dead. I hope we can put our heart in it and give it a message that we are supposed to give and not to make money, to help to forgive and make your life the best you can. In the end we will all die. I will go too. I hope I can use my life for something good in the meantime.